میرزایی, قانع, محبی, بهبود, طبرسا, تقی. (1391). چین خوردگی و ترشوندگی چوب تیمار شده به روش گرمآبی. مجله صنایع چوب و کاغذ ایران, 3(1), 1-11. قانع میرزایی; بهبود محبی; تقی طبرسا. "چین خوردگی و ترشوندگی چوب تیمار شده به روش گرمآبی". مجله صنایع چوب و کاغذ ایران, 3, 1, 1391, 1-11. میرزایی, قانع, محبی, بهبود, طبرسا, تقی. (1391). 'چین خوردگی و ترشوندگی چوب تیمار شده به روش گرمآبی', مجله صنایع چوب و کاغذ ایران, 3(1), pp. 1-11. میرزایی, قانع, محبی, بهبود, طبرسا, تقی. چین خوردگی و ترشوندگی چوب تیمار شده به روش گرمآبی. مجله صنایع چوب و کاغذ ایران, 1391; 3(1): 1-11. بررسی چین خوردگی شدن چوب‌های راش (Fagus orientalis) و پالونیا (Fagus orientalis) بر اثر تیمار گرمآبی در کنار ویژگی‌های ترشوندگی و قابلیت جذب آنها هدف‌های اصلی این پژوهش بودند. بدین خاطر، نمونه‌های چوب با ابعاد 6×6×50 سانتی‌متر تهیه شدند و سپس در درون رآکتور ویژه اصلاح چوب و در شرایط آبی، در دماهای 130 و 150 درجه سلسیوس و مدت زمان ماندگاری 30 دقیقه تیمار شدند. وزن و ابعاد خشک نمونه‌ها پیش و پس از تیمار گرمآبی تعیین شدند تا چگالی، چین خوردگی، افت وزن ناشی از تیمار آنها تعیین شوند. هم چنین نمونه‌های کوچکی نیز تهیه شد و به مدت 1000 ساعت در آب غوطه‌ور شدند تا میزان جذب آب آنها اندازه گیری شود. زاویه ترشوندگی چوب‌ها نیز تعیین شد تا میزان آب‌گریزی آنها مشخص شود. نتایج نشان دادند که با افزایش دمای تیمار تا 150 درجه سلسیوس، چگالی چوب‌ها افزایش یافت و چوب‌ها در همه جهت های خود دچار چین خوردگی شدند؛ ولی چین خوردگی مماسی چوب‌های تیمار شده بیش از جهت‌های دیگر بود. زوایه تر شوندگی چوب‌ها نیز با افزایش دمای تیمار بیش‌تر شد. تیمار گرمآبی سبب کاهش میزان جذب آب چوب‌های تیمار شده و افزایش ویژگی آب‌گریزی آنها شد. 1- Anonymous, 2002. The Plato technology: A novel wood upgrading technology, Online at: www.platwood.nl. 2- American Society for Testing of Materials, ASTM D 2395-02, 2003. Standard test methods for specific gravity of wood and wood-based materials. 3- Ayrilmiş, N., Laufenberg, T.L. and Winandy, J. E., 2009. Dimensional stability and creep behavior of heat treated exterior medium density fiberboard, European Journal of Wood Products, Vol. 67: 287-295. 4- Bhuiyan, M.R.T., Hirai, N., and Sobue, N., 2002. Changes of crystallinity in wood cellulose by heat treatment under dried and moist conditions, Wood Science, Vol. 46: 431-436. 5- Boonstra, M.J., Rijsdijk, J.F., Sander, C., Kegel, E., Tjeerdsma, B., Militz, H., van Acker, J. and Stevens, M., 2006a. Microstructural and physical aspects of heat treated wood. I. Softwoods, Maderas. Cienca Y Tecnologia, Vol. 8 (3):193-208. 6- Boonstra, M.J., Rijsdijk, J.F., Sander, C., Kegel, E., Tjeerdsma, B., Militz, H. and van J. Stevens M., 2006b: Microstructural and physical aspects of heat treated wood. II. Hardwoods, Maderas. Cienca Y Tecnologia Vol. 8 (3): 209-217. 7- Boonstra, M.J. and Tjeerdsma, B., 2006. Chemical analysis of heat treated softwoods, Holz als Roh- Und Werkstoff, Vol. 64 (3): 204-211. 8- Christiansen, A.W., 1990. How overdrying wood reduces its bonding to phenol formaldehyde adhesives: a Critical Review of the literature. Part I. Physical responses, Wood and Fiber Science, Vol. 22: 441-459. 9- Esteves, B., Marques, A.V., Domingis, I. and Pereira, H., 2007. Influence of steam heating on the properties of pine and eucalypt woods, Wood and Science Technology, Vol. 41: 193-207. 10- Garrote, G., DomõÂnguez, H. and Parajo, J.C., 1999. Hydrothermal processing of lignocellulosic materials; Holz als Roh- und Werkstoff, Vol. 57 (3): 191-202. 11- Gündüz, G., Aydemir, D. and Karakas, G., 2009. The Effect of thermal treatment on the mechanical properties of wild pear (Pyrus elaeagnifolia) wood and changes in physical properties, Materials and Design, Vol. 30: 4391-4395. 12- Hillis, W.E., 1984. High temperature and chemical effects on wood stability, Wood Science and Technology, Vol. 18: 281-293. 13- Kelley, S.S., Rials, T.G. and Glasser, W.G., 1987. Relaxation behavior of the amorphous components of wood, Journal of Materials Science, Vol. 22: 617-624. 14- Kubojima, Y. and Ohta, M., 2000. Bending strength and toughness of heat treated wood, Journal of Wood and Fiber Science, Vol. 46: 8-15. 15- Metsa-Kortelainen, S., Antikainen, T. and Vittaniemi, P., 2005. Water absorption of sapwood and heartwood of Scots pine and Norway spruce heat treated at 170°c, 190°c and 230°c, Holz als Roh-und Werkstoff, Vol. 64: 192-197. 16- Mohebby, B. and Sanaei, I., 2005. Influence of hydrothermal treatment on physical properties of beech wood, The International Research Group on Wood Preservation, IRG Document No. IRG/WP 05-40303. 17- Mohebby, B., Fallah-Moghadam, P., Ghotbifar, A. R. and Kazemi-Najafi, S., 2011: Influence of Maleic-Anhydride-Polypropylene (MAPP) on Wettability of Polypropylene/Wood Flour/GlassFiber Hybrid Composites, J. Agri. Sci., Vol. 13: 877-884. 18- Poncsak, S., Kocaefe, D., Gastonguay, L. and Younsi, R., 2006. Thermal treatment of electrical poles, Wood Science and Technology, Vol. 43: 471-486. 19- Santos, J.A., 2000. 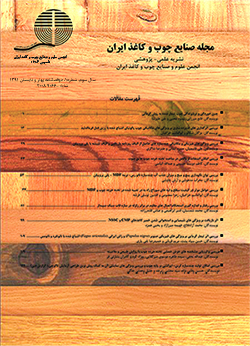 Mechanical behaviour of eucalyptus wood modified by heat, Wood Science and Technology, Vol. 34: 39-42. 20- Sundquvist, B., Westermark, U. and Eriksson G., 2006a. Degradation of cellulose during hydrothermal treatment of wood (Betula pubescens Enrh. ), Cellulose Chemistry and Technology, Vol. 40 (3): 217-221. 21- Sundquvist, B., Karlsson, O. and Westermark, U., 2006b. Determination of formic acid concentrations formed during hydrothermal treatment of birch wood and its relation to colour, strength and hardness, Wood Science and Technology, Vol. 40 (7): 549-561. 22- Tjeerdsma, B.F. and Militz, H., 2005. Chemical changes in hydrothermal treated wood: FTIR analysis of combined hydrothermal and dry heat-treated wood, Holz als Roh-und Werkstoff, Vol. 63(2): 102-111. 23- Weiland, J.J. and Guyonnet, R., 2003. Study of chemical modification and fungi degradation of thermally modified wood using DRIFT spectroscopy, Holz als Roh- und Werkstoff, Vol. 61: 216-220. 24- Winandy, J.E. and Smith, W.R., 2006. Enhancing composite durability: Using thermal treatments, In: Barnes, H.M. (ed. ), Proceed. Wood Protection, March 21–23, Forest Products Society, New Orleans, Louisiana, pp 195–199. 25- Yildiz, S. and Gümüşkaya, E., 2007. The effect of thermal modification on crystalline structure of cellulose in soft and hardwood, Building and Environment Vol. 42(4): 62-67.